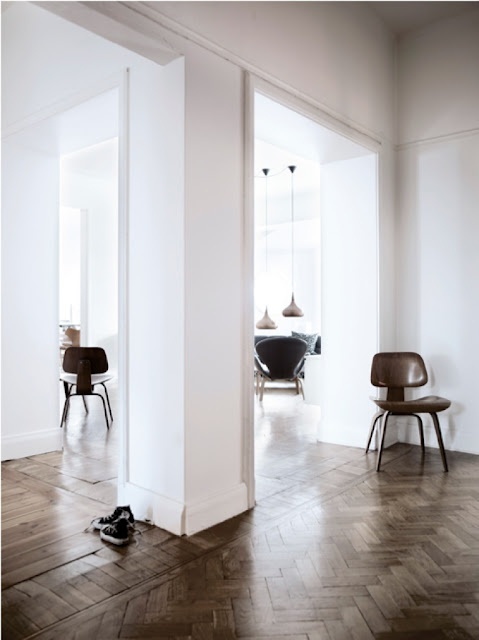 Natty by Design: herringbone floors! source I don't have one friend with dark wood flooring that doesn't wish they would've picked something lighter because of how easily it shows dust. Dark floors are amazing, but I'm a little over the top in the cleaning department already, so we're going to stick with wood the color of dirt. Now that we know we're looking for wood the color of dirt, we've started the scouring the local flooring showrooms. Herringbone floors are to die for, but since Zac will be installing them I have to defer to him and he's not loving all the extra labor attached. That didn't stop me from showing him these photos to let the thought marinade for a bit…. Any thoughts or experience with wood you've loved? I'm completely open to suggestions at this point! Gorgeous!!! I love the mid (dirt ha!) shade.. I'll cross my fingers for you that he comes around! 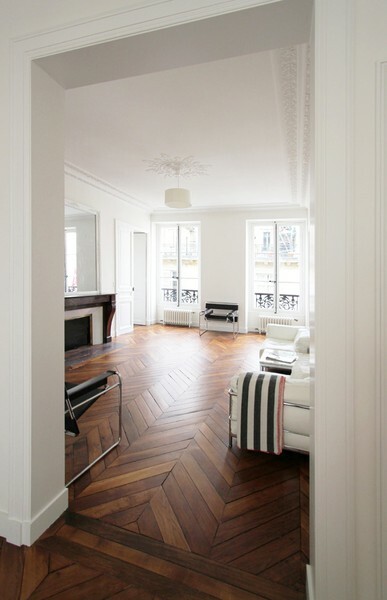 Ahhhh I love herringbone floors! The Corcoran Gallery of Art in DC has them, and I was drooling over them last week while visiting an exhibit there. If the hubby is concerned about installation, tell him it might actually be easier to cut a bunch of boards one length and lay them in a set pattern, as opposed to having to think about the size of each board he puts down and how it looks compared to the pattern of other rows. I'll have to mention that to him. Thanks, Sarah! I was watching I Hate My Kitchen on the DIY Network & they layed a herringbone floor on a recent episode. It wasn't the whole room, just the center portion. But it came on a mesh backing which allowed them to lay several planks at one time. After seeing that, I Googled "herringbone wood floors with mesh backing" & several flooring places came up. It was under the catagory-Parquet. You might want to check it out. I had a rustic Hickory installed in my living, dining & kitchen & I swear, you can never tell when it's dirty. Love it. When you select your floors, not only look for something lighter, but also with a lot of variations in the wood tones. And don't get a shiny finish. That also shows a lot of dust. I'm going to have to look into this! we have solid wood teak ( from Bangkok..the real deal) parquet and let me tell you, it is BUSY!!! Think twice before going for all the busy pattern. you do not want your floor to boss you around!!! I WANTED simple strip flooring many years ago when this went in instead.... and it is a long story... but being recenly refinished it is not going anywhere.... it IS beautiful but sometimes I shudder also. Hard to find other things that "play nice" with it. GO SIMPLE!! you can go dramatic in pillows or something easily replaceable!!! Thank you for sharing. All this makes sense, but I wouldn't have ever thought of this until it was too late! I dont like this kind of floor at all, because it appears to be so busy and the effect it generates in my opinion is totally not proportion to the effort in cutting all those wood planks. It can at most be used on an accent wall I would think.. I think like walls and big pieces inside the house, they shall appear calm and comfortable, but this one is so full of twisting and jumping all the time. sorry to disappoint you. Over on Addicted2Decorating she just did a table top with a Chevron pattern (some of the images you show are Herringbone and some are Chevron). It's all the same angle cut and she set up her saw to do the measuring. Sounded easy to me. Check it out. I LOVE herringbone floors. 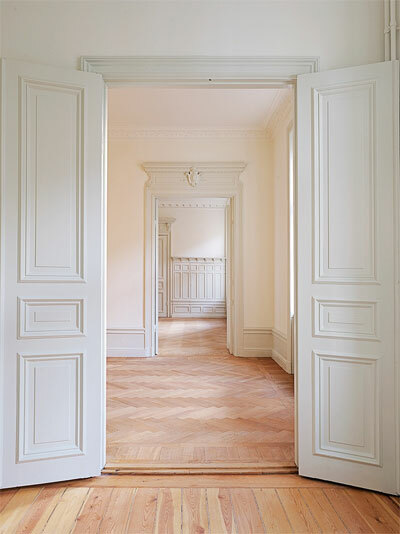 I lived in an apartment in Switzerland with lovely wood herringbone floors for 6 months and never felt like it looked too busy. Maybe it also helped that our furniture was minimal. 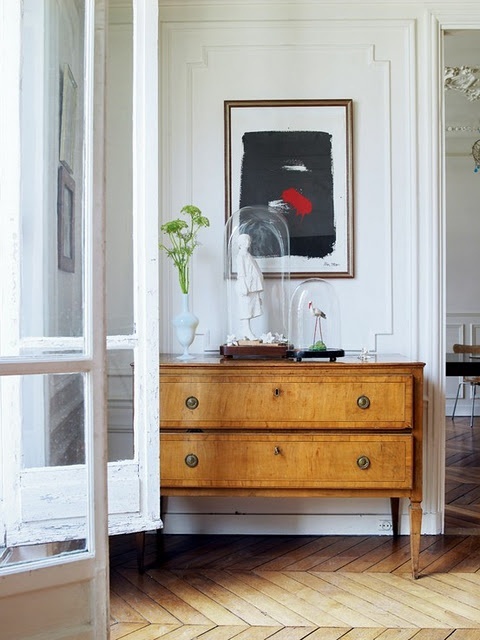 Agreed ... herringbone floors are so classic and so lovely. And interesting to read your comment about dark floors showing dirt. When we built our house 5 years ago, I wanted super-dark floors, but my builder lectured me about how they would show dirt. I told the installer to go dark anyway, but then he lectured me about our house not getting much natural light and since I chose a darker greige for the walls, dark floors would be too much. I told him to go dark anyway. What did I end up with? Medium toned floors. Was I mad at first? You betcha. Am I grateful now? You betcha. Since I'm not one of those people who sweep all the time, and since I have a crumb-dropping teenager and four fluffy cats, my medium toned hardwood floors hide a lot of the mess! 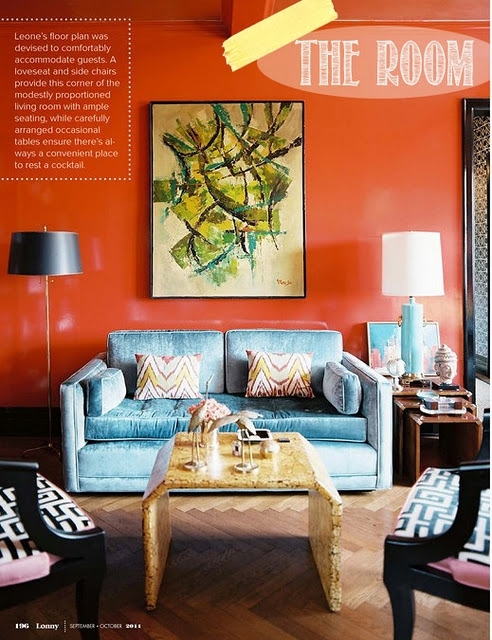 What about instead of angle cuts, you install them parallel and perpendicular to the walls- like this photo?